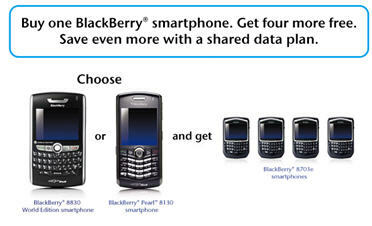 Bell has a pretty cool deal going in case you want to get your hands on 4 free BlackBerry 8703e devices. All you have to do is buy a new BlackBerry 8830 or BlackBerry Pearl 8130 and meet all the requirements in the the two paragraphs of lightly colored fine print found at the bottom of the promotion page. Thats really interesting news for BlackBerry Buyer, need to check it again with my friends. Tarif plans are also good. Nice way to clean out inventory while getting business. I just wouldn’t understand why someone would be willing to accept the older model, even if it’s free. Some companies I know have already phased them out and had them replaced. Some had to do with the BB ‘thumb’ concern, that it wasn’t ergo friendly and went to the track ball immediately. Place 4 curves or pearls in there for free and its the best deal out there! My company did this with Telus this past summer, I don’t think it was advertised though. The only models available were the 8703e, still a good deal.